Character » Spider-Man appears in 14203 issues. Anyways, I really hope you enjoy the thread! The headings below all contain hyper-links to their respective sections. You can click any of the main headings (the whole number ones - ex. strength or durability) to be transported directly to that section, or you can just scroll down the thread at your leisure. I have also tried to order feats in each sub-category by impressiveness, though that was obviously subjective, so your mileage may vary. If you really think something needs to be re-ordered, feel free to shoot me a PM or post down below. 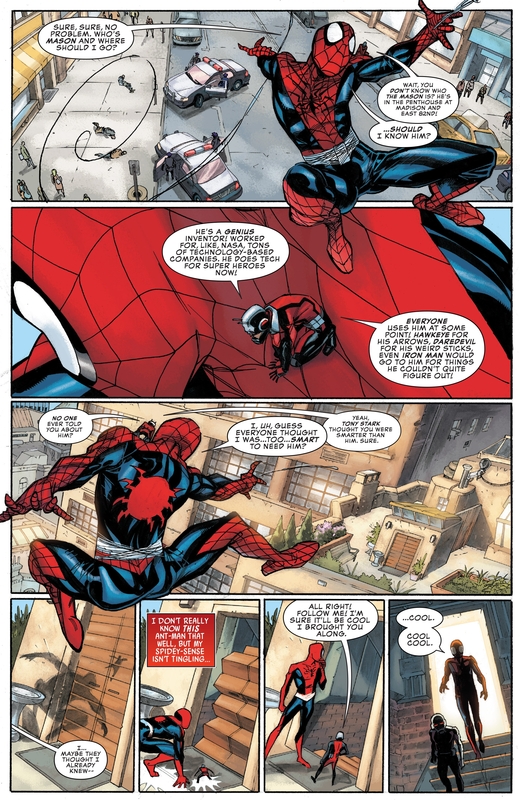 If a feat has an asterisk in brackets following its description, as shown here: (*), then it is from a story which is retroactively set in Spider-Man's past (such as Untold Tales of Spider-Man, or Spider-Man: Learning to Crawl), which means it may be debatable regarding whether it is canon or not. I haven't included feats from stories which are set in Spider-Man's past, but certainly don't occur in 616 (ex. Spidey). Genius inventor Hophni Mason can only build a basic version of Peter's webshooters (Peter Parker: The Spectacular Spider-Man 5) - Tony Stark goes to this guy for help when he has armor troubles! 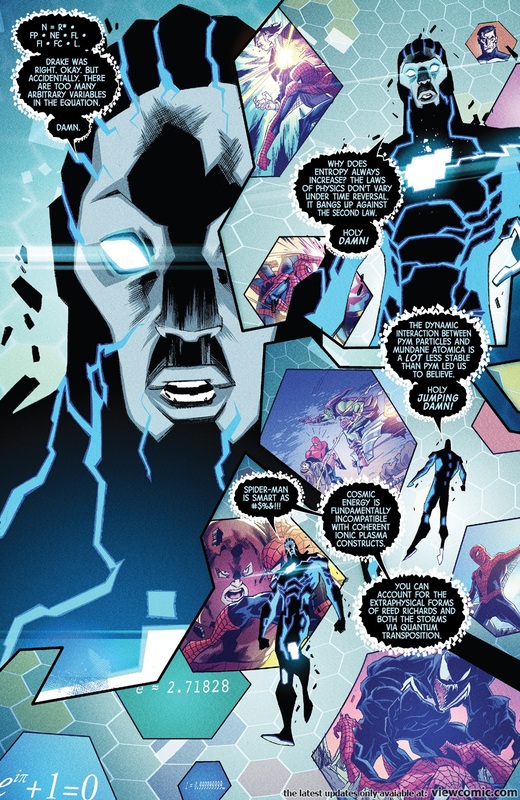 Spider-Armor Mark IV protects from a punch with the force of over a billion people (All-New Inhumans 6) - for reference, Collective Man was able to smash US Agent's vibranium shield with a single punch in Mighty Avengers #28. Spider-Armor Mark IV takes 2 separate blasts from Shiklah's Sceptre of the Manticore which emits at least one exajoule of energy (Spider-Man/Deadpool 15/16) - for reference, one exajoule is approximately 5 times the yield of the Tsar Bomba (the largest nuclear weapon ever made), 2,500 times the energy released by the Chelyabinsk Meteor, and around 20,000 times the energy released by Little Boy when it was dropped on Hiroshima. Spider-Armor Mark IV is able to hold up most of the weight of a skyscraper (rubble/debris) until it collapses over him (Peter Parker: The Spectacular Spider-Man 5). It appears that Spider-Man is holding up the majority of the skyscraper since when Spider-Man starts to buckle the entire skyscraper collapses as if he was the only thing holding it up. Also, we can clearly see Spider-Man was at the bottom of the skyscraper and that there were no large pieces of debris elsewhere when Uatu is able to run out of the destruction site unhindered. The only debris left standing, without Spider-Man supporting it, are a couple of foundation beams for the skyscraper. The armor has gliding/flying capabilities, spider-saucer explosives, on-board sensors for complete vicinity readings, and is durable enough that nothing short of a Howitzer can penetrate it. Elektra's sai cannot penetrate the armor (when cloaked) (Spider-Man 2099 v3 17). This is impressive since Red Hulk thought Elektra's sais are adamantium after they pierced him (Thunderbolts v2 28) and the sais can also stab through the likes of Red She Hulk (Incredible Hulk v1 608) and Hulk himself (Uncanny Avengers v3 17). Thor says Spider-Man's strength is impressive and Hulk thinks he felt Spider-Man move (Superior Spider-Man Team Up 1) - for context, both Thor AND Hulk were holding Spider-Man back but Hulk said he could still feel Spidey move even through that! This section is for feats I have tracked down but haven't gotten around to posting on my imgur or adding them in categories on this thread yet. Unlike the rest of the thread, I haven't tried to order these feats in terms of impressiveness. Oh boy. That 4th feat. Real good there. @strongtower7: Yeah you really need to read the comics its where he really shines. @strongtower7: thanks mate, I'll be looking forward to it! So, I've got around 600 scans for the first published draft of this, and I'm in the process of uploading them to imgur as we speak. Here's a link to peruse what I've uploaded so far (and it will stay updated as I upload more) until I finish uploading and start linking each individual feat back here. :) And of course, I will keep both the imgur link and this thread constantly updated with new feats from new comics, as well as old feats I re-read. this is my new favorite ComicVine account, lol. Anyways, all scans have been uploaded to imgur. That's 340 separate feats and 586 images. I'll start embedding them in this thread tomorrow. Cap can use Chi ? @ldm: well, I guess he can. I'm not really a Cap expert myself, but isn't he supposed to have learned like all the different martial arts or something? @blackspidey2099 This is awesome! Fantastic job. @blackspidey2099: Damn man what a good thread ! You should ask to be pinpointed and you should post the content on other sites as well ! I haven't read it all yet, but did you mention the fact that in "Kraven's Last Hunt" he managed to get out by himself out of his own grave. He was burried alive. Thank you! I'm not sure what being "pinpointed" is, but I may post this on other sites too if I get time. The problem is that I'm not sure if the ComicVine formatting will work on other sites, so I'd have to relink everything and that would be boring and tedious, lol. As for Kraven's Last Hunt, while that was a good story, none of those were impressive feats for Peter (getting KOed for days by a poison, getting shown up by Kraven who is significantly weaker and less powerful, etc.). Even digging out of a grave isn't too impressive for Peter - physically. I might be able to put it in the willpower section, though. However, it's been a while since I read it, so I will go through it again to see if I can find anything. Or, if you are reading it, please feel free to post a specific instance out of that story (or any others) which showed Peter doing something impressive or out of his usual capabilities. I've just currently finished reading Peter Parker: Spider-Man, so I'm working on making scans of the best feats I found in that series (look at the post above yours), uploading them to imgur, and then posting them here. When I'm done with that, I'll move on to other issues.